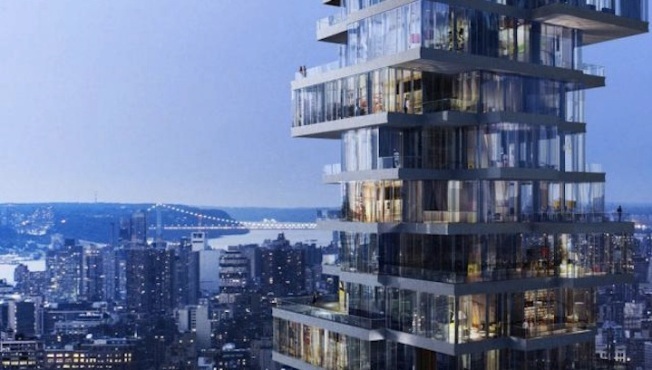 $25 Million Penthouse In The Jenga! Tower Is Kind Of A "Steal"
A Jenga look-alike tower with plans to sprout up in Tribeca in New York City will bring buyers a beautiful space and protected views of the city. A Jenga look-alike tower with plans to sprout up in Tribeca will bring buyers a beautiful space, protected views of the city, and at somewhat (uh, sort of) a steal, reports the New York Observer. Last month, the Alexico Group closed on a $350 million construction loan for the downtown tower, and already nine units, including a two-bedroom on the 14th floor and a $24 million full-floor penthouse on the 57th floor have been listed for prices that are steep, but it's arguably a steal compared to some of the similar construction uptown. The 5,252-square-foot penthouse is going for about $4,500 per square foot (to compare, a building uptown is asking an average price of $6,000 a square foot), and has four very generous bedrooms. The two-bedroom unit on the 14th floor is set at $3.62 million, or $2,000 a square foot. Because the tower rises 800 feet in a neighborhood with little high-rise construction, the views are fairly guaranteed. And the rooms are sure to take advantage of that, particularly the penthouse, which offers northern, eastern, and southern exposures. It also is yet to be seen if this building is capable of introducing a new classification of life in Tribeca, a place never before remembered for its views. And it is worth mentioning, that besides views, stunning architecture and a fairly reasonable price, buyers will get a structure that, though it looks like a Jenga tower, they can trust will stand tall.